Are you longing to indulge in a luxury amidst greenery? Not now perhaps in near future. We have got you covered. 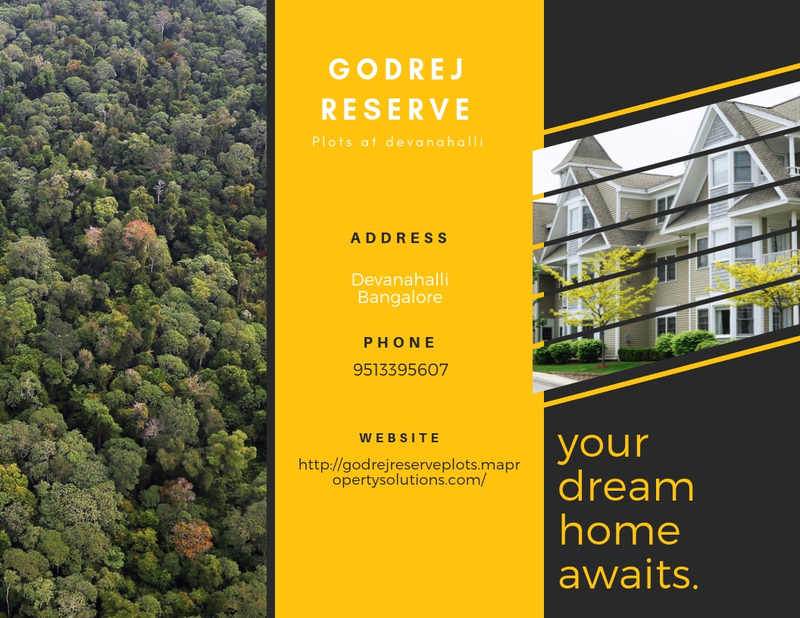 No better option than Godrej Reserve Plots in Devanahalli Bangalore exists. The plot is nestled in the lap of nature in between gardens, parks, and vast landscaped area yet not far away from the liveliness of the city. People enclosed in green spaces tend to live longer than those who don’t. Why? Because living around greens and vegetations have life-prolonging benefits. Nature help soothes mental illness, relieve stress, increase and encourage social interaction and physical exercise. This effect is not just limited to forests and beaches miles away from you but is true to any kind of green spaces. It can be a landscaped garden, a local park, a hiking trail, or a coastline to soccer fields provide that it must have few qualities. Simply having shrubbery does not assure a positive experience. To seek a healthy and happy life the quality of green space matters more than the quantity. Before diving into the project, let us dig deeper into explicit ways in which you can blend greenery in your urban lifestyle around Godrej Reserve Plots improves your life. To attain healthy immune system avoid using those fossil fuel vehicles that not only increase traffic but is the major reason for public health issues like increased stress and reduced quality of life. There is a well-known Japanese therapy named Forest bathing in which people deliberately spend time in nature. Spending time in nature help develop your immune system. The killer cells in our body are life-threatening for a proper functioning of immune function. Just a single day trip to forest helps boost cell count and activity and upsurge anti-cancer proteins thus improving immunity. Gradually reduce the energy needed to run your home. Replace old inefficient windows and doors, install dimmer switches and electronic thermostats, use water-reducing dual flush toilets, choose appliances with certified ENERGY STAR. Little by little, add on to more ecologically responsible lifestyle and put more money in your pocket, thus reducing your stress. Because Just a quick short break in and around nature do wonder. Without any long and weary walk, just head out to the greenery and reset your stress response. With no surprise, green spaces in the neighborhood can help you get hold of your nervous system and patiently address to the cause of your stress. People generally focus on physical fitness but mental fitness is equally important. Learn, encourage and teach green living lifestyle habits. Habits, like composting, Gardening and promoting alternates of pesticides, help drop down your mental tension. Also, moving to greener spaces ameliorate your mental health. It is more dependent on regular exposure to greenery. If you plan to move and settle near green spaces like Godrej Reserve plots in Devanahalli, it would suffice. Greenery make you productive, rich and yielding. Initiate a green community and strengthen the environmental movement, make new connections that share the same ideas and give more chance to your city to become greener. This way, your reflex attention gets engaged when you are exposed to green spaces. Without using much power of your brain, you can focus on seeing, hearing, smelling etc. Similar is the case with voluntary attention, it is restored. The hard focus we need to concentrate on work-related tasks without deviating is strengthened. Not the least, exposure to greenery improves your sleep quality. After all workspace toil you start nodding your head shortly, still do not feel fresh the next day. Move to a space filled with green all around to help yourself, go camping or for the long walk in gardens or parks, all this typically gives you improved and quality sleep so that you wake up refreshed like never before. While a lot of benefits accrue, greenery is passive. Just ‘Be’ and see the positive effects on your body, mind, and soul by living in healthy vegetation with the urban lifestyle. So, become a part of something magnificent and live in an area full of ample green spaces to have a healthy and delightful stay at Godrej reserve Plots, Bangalore.